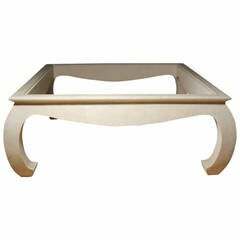 Maitland Smith leather coffee table with faux Leopard design, carved wooden feet, top opens for storage. Very nice condition. 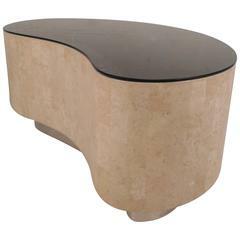 Dimensions: 43" L x 34" D x 18" H.
Baker faux bamboo/tortoise cocktail or coffee table with brass and glass top, top lifts off for easy moving and cleaning. 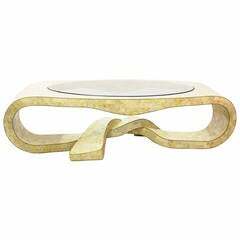 Maitland-Smith tesselated stone sculptural coffee table. Maitland Smith Tesselated opium or coffee table. This table is in very good general condition. 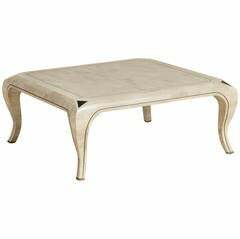 The table is in black or dark green marble with a brass inlay. 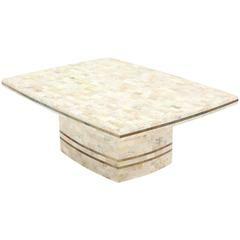 A Maitland-Smith designed stone veneered coffee table with brass and contrast stone veneer inlay on cabriole legs, 1980s. 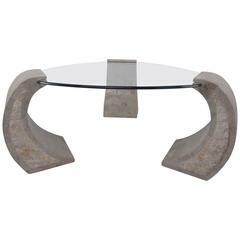 Mid Century Modern tessel stone work rounded edge square coffee table by Maitland Smith.